In 2012, $1 billion seemed like an awful lot to pay for Instagram, given that the photo-sharing network had just 30 million users. But, Facebook was weak on mobile in those pre-IPO days, and the purchase of Instagram allowed an immediate shoring up in that area. “For years, we’ve focused on building the best experience for sharing photos with your friends and family. Now, we’ll be able to work even more closely with the Instagram team to also offer the best experiences for sharing beautiful mobile photos with people based on your interests. Not only have they kept Instagram independent, but we’re entering an all-new era in the Facebook/Instagram relationship: the era where the child bests the parent. Earlier this year, I reported on groundbreaking new data from Edison Research that found Facebook usage declined for the first time ever. 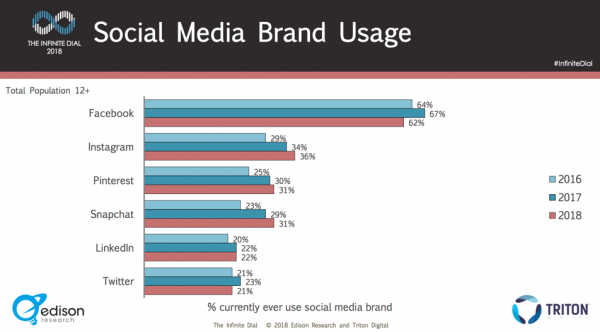 The same survey uncovered that while Facebook diminished, Instagram flourished. I don’t think that’s an accident, and I don’t think it’s likely to change any time soon. In fact, I predict that by 2020, Instagram will overtake Facebook in total usage in the United States. You may have some hypotheses of your own, but here are the nine reasons I believe Instagram is up, and Facebook is down. Given that it was a mobile-only platform for many years, and its narrower array of content types, it’s no surprise that Instagram is a better mobile experience than Facebook. Facebook has come a long, long way in this regard, but Instagram is made for the phone, period. And with 80 percent of social content being consumed in a mobile environment, that structural advantage is significant. Again, this one isn’t a shock, since Instagram is where Zuckerberg and friends first incorporated the “stories” function that was stolen from inspired by Snapchat. Facebook has stories of its own now, but the interface tie between Facebook News Feed and Facebook Stories is murky and tenuous, at this point. Instagram Stories are also far more popular than Snapchat’s version. 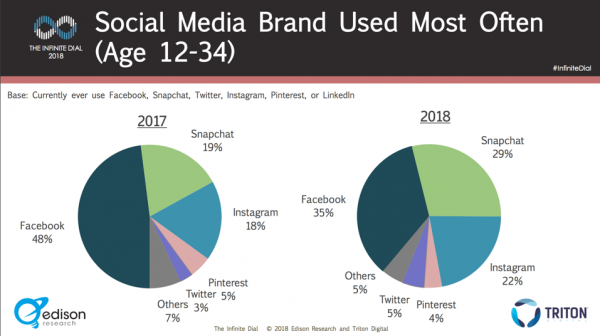 The Infinite Dial study from Edison showed that among Americans ages 12 to 34, usage of Facebook declined sharply between 2017 and 2018, with increases in Instagram and Snapchat usage. Since the data was released, Snapchat has had their own problems with user growth and loyalty, driven by an endlessly changing interface, and a $1.3 billion dollar drop in valuation linked to a tweet from Kylie Jenner. 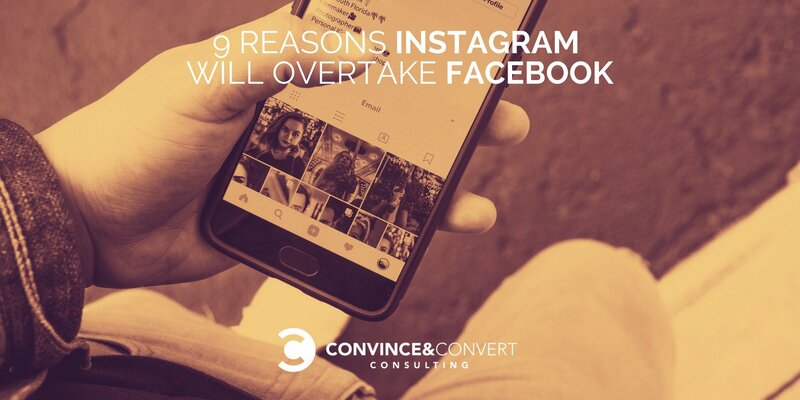 Consequently, I believe that Instagram will continue to win over youthful social media users, who are of course the future core of any social network. Direct commerce on Facebook has been tried several times, with only modest success. But commerce on Instagram is woven so tightly into the experience, that it feels like a very natural extension of the platform. I’ve personally bought a bunch of stuff on Instagram, and the sophistication of the targeting algorithm is very strong. And the experience is going to get even better, for users and for advertisers. Just this week, Instagram announced that they are rolling out in-app payments, meaning that you can buy from the photo directly, without having to leave Instagram to visit a website. This is going to transform Instagram into a commerce powerhouse for products. From a marketing standpoint, the constant changes to Facebook’s display algorithm for News Feed make it increasingly difficult (some say futile) to try to gain organic reach for company posts. In comparison, while Instagram makes changes, to be sure, they are less draconian, and the brand/user coexistence on Instagram is much better overall. There are many brands whose content is genuinely a pleasure to encounter on Instagram. Not sure that’s often the case with brand Facebook posts. Due to the heavy emphasis on hashtags from the beginning, and the widespread use of five to 20 of them in posts, it’s easier to discover content that you like on Instagram. Because of the ability to get content “found” on the platform, publishers have flooded the hashtag system and gamed the system. As a result, the Instagram Explore tab has declined in quality recently. Mark Zuckerberg announced that a new Explore is on the way, with better curation. I’m not suggesting there aren’t trolls and misanthropes on Instagram—there are. But in comparison to Facebook, where even the banalest of posts seems to devolve into some sort of politics-laden, us versus them food fight, the discourse (as it were) on Instagram feels—at least to me—more consistently positive and uplifting. I’m not alone. An unscientific poll I launched on Facebook found that 87 percent of my friends (219 took the survey) believe that Instagram is the more positive social network. Of course, positivity alone isn’t enough for Instagram to overtake Facebook in usage. But social media is supposed to be fun. It’s supposed to be an escape. It’s not supposed to be the place you confront your demons, or your accusers, in most instances. Now, whether or not all the perfect photos on Instagram make you feel better or worse about yourself is the matter of quite a bit of academic study right now, but at least you don’t have as many people yelling at you in the comments section. Facebook Messenger is an unqualified hit. Adoption is soaring, and Messenger is perhaps the best real estate for branded interactions right now, powered by bots and chat (including from Convince & Convert partners like Intercom and ICUC). But Instagram chat/messaging can do at least some of the things that Facebook Messenger can do, and that gap is closing, as video chat is coming to Instagram soon. If, given the option, you could keep your messaging function and your social network in one app instead of two, wouldn’t you do so? I know I would. As Facebook grows more cautious about developer ecosystem and data usage due to the Cambridge Analytica scandal and similar transgressions, it’s simultaneously embracing MORE developer engagement over at Instagram. This duality is fascinating and indicates that Facebook continues to be quite serious about keeping Instagram as a totally freestanding community. Just recently, the company announced that users will be able to use third-party camera effects and stickers. And, in a nod to Instagram’s present and future role as users’ preferred social network, they will be allowing users to share stories to Instagram from other apps, such as Spotify, GoPro, and others. This is also fascinating, as it sets up Instagram stories as the de-facto, highly flexible repository of users’ real-time experiences, even if those experiences were initially captured outside of the Instagram application. Facebook is still a behemoth and is the only social network that approaches ubiquity. But, Instagram is turning into a BETTER social network, in my estimation. If that continues, it’s entirely possible that Instagram becomes more popular than Facebook by 2020, at least among users in the United States. What do you think? Chime in over at Linkedin (ironic, I realize).